Intamin Worldwide is a designing and manufacturing company in Wollerau, Switzerland. It is best known for creating thrill rides and roller coasters worldwide. The Intamin brand name is an abbreviation for international amusement installations. The company has offices throughout the world including three in Europe, three in Asia and two in the United States. Intamin is a major player in the amusement park attractions industry, supplying some 22 different styles of rides to a variety of parks. The company has installed a total of 70 coasters in several countries around the globe. Intamin designed and built the first river rapids ride known as Thunder River based on the idea supplied by Bill Crandall, a past General Manager at the now defunct AstroWorld. Intamin also marketed the first Freefall (developed by Giovanola) experience and the first drop tower. Intamin's product range is in two broad categories, Rides and Thrill Rides, and Transportation. Intamin was amongst the first to create a magnetic propulsion system (linear induction/synchronous motor) and remains one of only a handful of manufacturers continuing to use such technology on roller coasters. Intamin also created the first hydraulic launch system (also known as the Accelerator), which is now being used to catapult roller coaster trains from standstill to speeds upward of 240 kilometres per hour (150 mph) in a few seconds before climbing up immense heights. Kingda Ka at Six Flags Great Adventure, for instance, is North America's tallest and fastest coaster, launching riders from 0–128 mph (206 km/h) in 3.5 seconds. Intamin is also known for its massive Mega and Giga Coasters, Intamin's terms for a hypercoaster. Intamin Giga and Mega Coasters currently occupy three of the top five Golden Ticket Awards with perennial favorites Millennium Force, Superman the Ride and Expedition GeForce. Intamin uses computerized and industrialized engineering and manufacturing methods for its wooden coasters, rather than traditional on site fabrication. Coasters such as Colossos at Heide Park, Balder at Liseberg and El Toro at Six Flags Great Adventure utilized this manufacturing technique. Unlike other traditional wood coasters, these rides use prefabricated track sections made of a high-strength wooden laminate that can be secured on-site when the superstructure is completed. This design enables the coaster to reach speeds and navigate course elements smoothly, like a steel roller coaster, while retaining the look and some of the traditional feel of common wooden coasters. Another recent roller coaster development by Intamin is the ZacSpin, a type of 4th Dimension roller coaster that was first seen in 2007. Kirnu at Linnanmäki in Finland was the first ZacSpin in the world and opened on April 27, 2007. It has individual cars, each with 8 seats, arranged in two pods coming off the sides of the car, each with 2 seats facing forward and two facing backward. This car is either lifted to the highest point by a conventional chain lift, or propelled around the course at a constant speed by a Linear Motor system. The company is known for being the original home to the famous (within the coaster world) Bolliger & Mabillard (B&M). The two engineers worked for Giovanola who in turn were frequently contracted by Intamin for their early stand-up roller coasters (Giovanola eventually started producing roller coasters independently). B&M broke away from Giovanola to form their own company which now supplies roller coasters as well. Similarities between the two companies are often obvious, such as the style of track used by B&M, which was used in a number of early Giovanola installations which were contracted by Intamin. Intamin brokered a number of rides that were manufactured by Waagner-Biro. 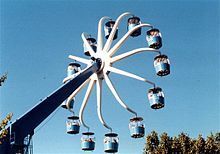 These included a series of rides for Marriott Corporation, each comprising a vertical column supporting multiple horizontal arms, with each arm supporting a Ferris wheel. The first was Giant Wheel which operated at Hersheypark in Hershey, Pennsylvania from 1973 until 2004. Similar Intamin supplied Waagner-Biro wheels included Zodiac (Kings Island, Mason, Ohio) and Scorpion (Parque de la Ciudad, Buenos Aires, Argentina). All are now defunct. Sky Whirl, the world's first triple Ferris wheel, which debuted at both Marriott's Great America parks (now Six Flags Great America, Gurnee, Illinois, and California's Great America, Santa Clara) in 1976, was also manufactured by Waagner-Biro and brokered by Intamin. Also known as a triple Ferris wheel, Triple Giant Wheel, or Triple Tree Wheel, it was 33 metres (108 ft) in height. The Santa Clara ride, renamed Triple Wheel in post-Marriott years, closed on 1 September 1997. The Gurnee ride closed in 2000. The Orlando Eye, which opened in April 2015, was designed and built by Intamin. Outside the amusement realm, Intamin supplies monorail transportation systems which are used in both public transport networks and at tourist attractions across the world. Intamin was responsible for the design and building of the Moscow Monorail (Russian: Московская Монорельсовая Транспортная Система (ММТС)), which is 4.7 kilometres (2.9 mi) long and is located in the North-Eastern Administrative Okrug of Moscow, Russia, running from the Timiryazevskaya metro station to Sergeya Eisensteina street. Planning of the monorail started in 1998. It has six stations. In 2016, the Ashgabat Monorail in Turkmenistan was opened using Intamin equipment. Intamin has been in the news for a number of safety-related incidents. In 1984, three passengers riding The Edge at Six Flags Great America were injured and briefly hospitalized. The ride experienced a malfunction that caused it to fall backward down the wrong shaft. On June 9, 1991, 32-year-old Candy Taylor of Toledo, Ohio, fell to her death from Flight Commander, an Intamin Flight Trainer, located at Kings Island. Investigators determined that a design flaw in the seat divider could allow a rider to slide into an unoccupied seat and become free from the restraint. A coroner's report later revealed that the victim had a blood-alcohol level of 0.30 which may have also contributed. Speculation suggests the rider lost consciousness during the ride and slid out from the restraints. On May 16, 1999, a 365 lb (166 kg) guest was unable to close his lap bar on the Ride of Steel roller coaster at Six Flags Darien Lake. As a result, he was ejected, fell approximately 9 feet as the ride went over a camel hump hill, and suffered serious injuries. He sued the park and the ride manufacturer for negligence and was awarded US$3.95 million. In August 1999, a 12-year-old mentally disabled boy fell from the Drop Tower: Scream Zone at California's Great America and died. The victim's family claimed his harness was not locked properly. An investigation was inconclusive and no charges were filed. In September 2001, a 40-year-old woman fell from the Perilous Plunge attraction at Knott's Berry Farm into the water, was hit by the boat, and died. An investigation showed that the 300 lb (140 kg) woman had loosened the safety restraints so she could fit more comfortably into the ride. On April 16, 2004, a 16-year-old girl from Pontypool was killed after falling approximately 30 m (100 ft) from the top of the Hydro (now called Drenched) ride at Oakwood Leisure Park, Narberth, Pembrokeshire. During a trial brought by the victim's family against Oakwood, a jury returned a narrative verdict stating that the victim died due to being improperly restrained. The second incident of 2004 was on one of Intamin's mega coasters, Superman: Ride of Steel at Six Flags New England in Massachusetts. The ride, again with lap bar restraints, was dispatched with a cerebral palsy sufferer in the front seat, who died after being ejected from his seat. According to an investigation, the ride operators were primarily to blame for not ensuring the rider was properly secured. Intamin was also partially blamed because the ride's safety system allowed the train to be dispatched without all the restraints properly secured. The third incident of 2004 happened on July 14 and involved one of Intamin's launched stratacoasters. Four people were injured while riding on Cedar Point's Top Thrill Dragster. The riders were struck by metal debris that sheared off the coaster's launch cable during launch. They were treated at the park's first aid station. Two were further treated at Firelands Regional Medical Center. In June 2007, a 13-year-old girl lost both feet at the ankles on Superman: Tower of Power at Six Flags Kentucky Kingdom when a ride malfunction caused a cable to snap. She was brought to the hospital in critical condition but survived and doctors were able to re-attach her right foot. The park was later fined $1,000 for not properly maintaining the ride. A settlement was later reached with Six Flags Kentucky Kingdom that will provide for her throughout her life. On September 16, 2009, two guests were injured when a cable snapped on the Xcelerator roller coaster at Knott's Berry Farm. The 12-year-old victim had lacerations on his leg, while the adult victim complained of back injuries. On April 29, 2010, a ride train on Expedition GeForce partially derailed from the track, fully occupied with passengers. Riders were stranded 20m in the air, with eight of them complaining of nausea and bruising. On July 8, 2011, a 29-year-old guest was killed when he was ejected from the Ride of Steel roller coaster. The rider, an Iraq War veteran whose legs had been amputated, was on the front row of the roller coaster when he was thrown from the train during the course of the ride. Park officials stated that the ride was in proper mechanical order and that the various safety restraints were also working normally at the time of the incident, but that the attraction would remain closed pending an investigation. On February 24, 2012, a 14-year-old girl died in an accident at Hopi Hari, Vinhedo, São Paulo State, Brazil. She fell from the La Tour Eiffel drop tower ride, suffered cranial trauma, and died on the way to hospital. Initial investigations suggested the possibility of mechanical failure in a restraint latch. On July 24, 2012, the launch cable of the accelerator coaster Rita at Alton Towers, Staffordshire, UK, snapped during a morning test run. There were no passengers aboard at the time and no injuries occurred. On July 19, 2013, a boat on the Shoot the Rapids log flume at Cedar Point, rolled back down the ride's lift hill and flipped over, injuring seven, and was said to leave them stranded under water for a few minutes before park employees could get them out. Six were cleared by park medical staff, and one was examined at a local hospital before being released. The ride closed during the investigation. Cedar Point reopened the ride in May 2014. On July 7, 2014, a teenager was killed after his harness sprung open on Inferno, a ZacSpin coaster at Terra Mítica in Benidorm, Spain. When opened it featured the longest drop in the world and fastest speed on a wooden coaster. Currently standing but not operating. Expected to reopen in 2019 with new track. Accelerates from 0 to 82 miles per hour, covering 157 feet of launch track, in just 2.3 seconds. Was fastest coaster in Europe until 2017. Train is launched into a backward helix after drop. Held three world records at opening: Fastest multi-launch coaster, longest multi-launch coaster without inversions, greatest number of intersecting track points at 58 (no longer fastest multi-launch). Fastest multi-launch coaster at 77.7 mph (train is launched three times — forward, backward and forward again). Currently fastest LSM-launched coaster in the world. ^ "Cedar Point welcomes 2016 Golden Ticket Awards" (PDF). Amusement Today. September 2016. Retrieved September 11, 2016. ^ a b Pan, Phil (2003). "Colossos: Can a coaster be too good for itself". RollerCoaster! Magazine. Vol. 24 no. 3. Mission, Kansas: American Coaster Enthusiasts. p. 24. ISSN 0896-7261. ^ Marden, Duane. "Kirnu (Linnanmäki (Helsinki, Uusimaa, Finland))". Roller Coaster DataBase. Retrieved December 26, 2018. ^ "Theme Park Timelines". Archived from the original on 2015-01-18. ^ "SKY WHIRL at Marriott's GREAT AMERICA parks". ^ "EVOLUTION OF CALIFORNIA'S AMUSEMENT RIDES SAFETY LAWS". California Research Bureau, California State Library. 1997-08-01. Retrieved 2006-12-21. ^ "DESPITE RECENT DEATHS, PARKS SAY RIDES ARE SAFE". Deseret News. 1991-08-06. Retrieved June 3, 2011. ^ "Ride-Related Fatalities" (PDF). Emerson Associates. 2006-10-03. Retrieved June 3, 2011. ^ "Theme-park patron ejected from roller coaster". 2004-03-12. Archived from the original on 2007-09-28. Retrieved 2007-10-15. ^ "Thrill ride lawsuits". Courier-Journal. 23 June 2007. Retrieved 4 November 2011. ^ "Drop Zone death: no charges, no explanation". RideAccidents.com. 5 November 1999. Retrieved 4 December 2011. ^ "Ergonomics and a Deadly Ride on the "Perilous Plunge"". 2001-11-06. Retrieved 2007-04-05. ^ "Girl dies in 100ft rollercoaster fall". BBC Wales News. 2004-04-16. Retrieved 2007-08-29. ^ "Family unhappy after ride inquest". BBC Wales News. 2006-05-19. Retrieved 2007-08-29. ^ "Coaster riders question safety steps". ^ "Riders Injured on Top Thrill Dragster". WTOL-TV. July 13, 2004. Retrieved July 31, 2006. ^ "Teen's feet severed while on thrill ride - US news - Life - NBC News". msnbc.com. ^ Gordon Gibb (14 March 2011). "Aftermath of a Horrific Amusement Park Accident". lawyersandsettlements.com. Retrieved 24 December 2012. ^ Bild.de (29 April 2010). "FULL STEAM OUT OF THE TRACK POPPED: AGONY IN THE ROLLER COASTER". ^ "Double amputee Iraq war veteran dies after he was flung off roller coaster at 50 mph". Daily Mail. Associated Newspapers Ltd. 2011-07-09. Retrieved 2011-07-09. ^ "Adolescente morre após acidente em parque de diversões no interior de SP". Retrieved 2012-02-24. ^ "Rita Launch Cable Snaps -> COASTER-net.com: Amusement Park and Roller Coaster News, Information, Photographs, & more!". Archived from the original on 2012-07-31. ^ Kara Sutyak (July 19, 2013). "Person Released From Hospital After Cedar Point Ride Malfunction". fox8.com. Local TV, LLC. Retrieved July 20, 2013. ^ Gerard Couzens (8 July 2014). "Teenager killed after being thrown from roller-coaster called Hell at Benidorm theme park". mirror. ^ "Girl, 11, dies after Drayton Manor theme park fall". BBC. ^ "Wing Rider Coaster". Archived from the original on 2013-09-20. Retrieved 2014-01-05. ^ a b c "Roller Coaster Search Results, Element=LSM launch, sorted by speed". rcdb.com. Retrieved December 1, 2018. 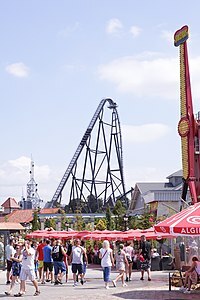 Wikimedia Commons has media related to Intamin.